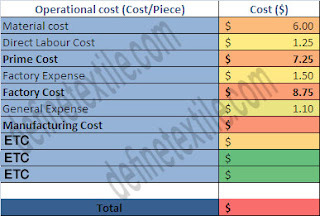 Costing is a process by which to set a price of a product is calculated by considering all the related factors. 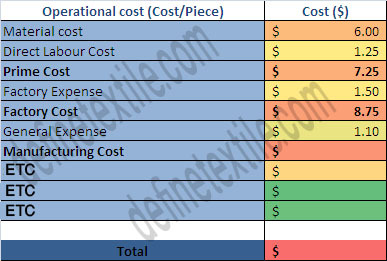 Doing Cost Analysis is a very important task for a factory which runs for business purposes. Costing of the products considering the raw material expenditure, salary of officers and workers, distributions and advertisement expenses etc. all direct and indirect expenses is considered very honestly. It is determined by a troop of accountants with advice and consultancy of executive director. Tex: The yarn number or count in the tex system is the weight in grams of 1000m or 1km of yarn. The system is therefore a direct system simply define and simple to use. For fibers, the fineness is expressed in “Militex”. Militex: Count in the militex system is the weight in mg of 1000m or 1km of yarn. Kilotex: Count in the kilotex system is the weight in kg of 1000m or 1km of yarn. Denier: The no. of count in denier system is the weight in grams of 9000m or 9km of yarn. Pound per spindle (Jute system): The yarn number or count in the pound per spindle is the weight in pounds of 14400 yards of yarn. English system (Ne): The yarn number or count in English system is defined as the number of hanks 840yds per pound. It is denoted by Ne. Metric system: The yarn number or count in metric system is defined as the number of hanks (1000m) per kg. It is denoted by Nm. Worsted system: The yarn number or count in worsted system is defined as the number of hanks (560yds) per pounds. It is denoted by Nw. Ginning of seed cotton: The freshly picked cotton has seeds in it is called seed cotton. After picking the cotton fiber has to be separated from seeds. The process by which the seeds are separated from the fiber is called ginning. There are mainly two types of ginning.